Finding big data about rural America is challenging. Finding big data about disability in rural America can seem impossible. Meanwhile, access to current information about disability in rural areas is important as these areas consistently experience higher disability rates than their urban counterparts. The Research and Training Center on Disability in Rural Communities (RTC:Rural) recently re-launched the Disability Counts Data Finder, an online tool that allows users to easily access disability data for every county in the United States and Puerto Rico. Using a simple interface, users select their state and counties of interest, and generate a table with population estimates, disability rates, margins of error, and rural/urban classifications. Disability Counts uses the most recent 5-year American Community Survey data and the 2015 Office of Management and Budget Metropolitan-Micropolitan Statistical Areas delineation files. These datasets were specifically chosen so that Disability Counts could provide insight into the county’s rural status alongside the disability rate, clearly showing the correlation between disability rates and rural areas. We have found that this information is particularly sought after by advocates and policymakers. 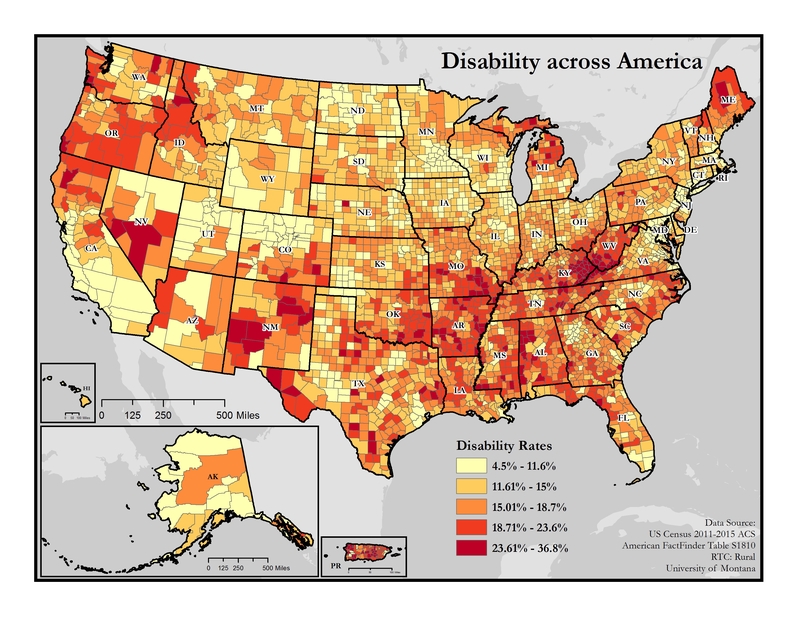 Disability rates by county across the United States – rural counties consistently show higher disability rates than their urban counterparts. While ACS data on disability is available through the American FactFinder website, some of RTC:Rural’s stakeholders in the disability community had advocated for a tool that was more accessible for use by screen reader technology. Consequently, RTC:Rural created Disability Counts which provides rural/urban classifications, is fully accessible, and easier to use. For those seeking basic population and disability data, Disability Counts is an easy and quick way to access that information. However, for those who do want to use the FactFinder to find more in-depth data, RTC:Rural also provides a step-by-step guide on how to use the FactFinder to access disability data. Those with questions about the Disability Counts Data Lookup can contact RTC:Rural Research Associate Andrew Myers. This entry was posted in News and tagged American Community Survey, data, Disability Counts, geography, population, resource, rural, tool.